Welcome to the Garifuna World! You are about to experience the origin of the Garifuna community, their incorporating process to society, their resistance to English and French Colonization and their deporting to Honduran land. The Garifuna society, also known as the Black Caribs, was first originated in XVII in San Vicente, about a century after the conquering of Central America, South America, and the lower Antilles. The conquerors were not interested in San Vicente and Dominica at first because of its topographic features, lack of precious metals and grasslands for cattle raising, but the Caribs did become interested because of its magnificent areas for fishing. Who were the Caribs? 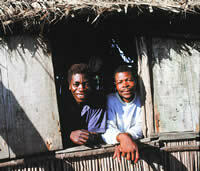 The Caribs were strong, robust men, of small stature, and mongoloid physical features. They had long, black, straight and thick hair, perfectly cut to their forehead and were generally dressed in a colorful christening skirt. Their original name was Callinagu and their place of origin was from the Orinoco Delta, which they abandoned for conquering the Lower Antilles. When they arrived to the Lower Antilles, they exterminated the Arahuaco men, but decided to keep the women for their convenience. The union of these two Indian groups gave origin to a new society called the Caliponan (also known as the Yellow Caribs, Red Caribs, and Amerindians). The beginning of the formation process was in 1635, and believed to have been caused by the sinking of two Spanish ships loaded with black slaves who were being delivered to their buyers. In those days it was common for the Caliponan to give misleading directions, which lead them to the riverbanks where they disposed the ships from their shipments (gold, wine, and slaves) and killed all of the crewmembers. The Africans were anxious to establish friend links to avoid being sent back to their owners as slaves; therefore they soon adopted their customs and native garifuna language. Shortly after, they married the Caliponan women who gave birth to a whole new kind of siblings. Their descendents preserved the height and skin color of their father, who on the contrary of the Caliponan were tall and corpulent. This new society (Garifuna) centered their family life in the sexual division of work as a base for their economic activities. Shortly after came the conquering of Barbados and Santa Lucia, and men, who could not accept the new rulers, accumulated goods and emigrated in canoes towards San Vicente (28 miles from Barbados). These men, along with the Caliponan, then became such powerful allies in their war against conquerors, that they were considered an allied and independent group. In the XVII century, a drastic change occurred in the Vicentinian society. The black society had become the dominant group due to their geometric growth because of the immigration of refugees. The constant fighting for power and territorial disputes soon divided both sides. 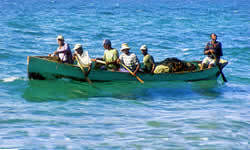 Garifunas forced the Caliponan to move to the Western part and they move to the Northwestern part of the island. Both groups tried to resolve their personal difficulties, because they were aware that an internal division would drive the conqueror's attention to them. When news about their differences arrived to France, the French took part in this division by supporting the Caliponan. They soon inhabited Caliponan land, while Garifunas defended their land from any European colonization. The French made many intents, but they soon were convinced they had to stop interfering and had to maintain peace links with Garifunas. 1730: San Vicente, Dominica, and Santa Lucia are declared to be free from European inheritance. 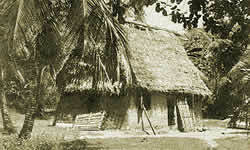 1742: British colony is established in Rattan (Roatan). 1748: Aix-La Chapelle Treaty is signed in which San Vicente, Dominica, and Tobago are declared of exclusive possession of the Caliponan natives. 1750: Peace Treaty signed between Spain and Great Britain. 1756: War between France and England begins. 1759: English attack Martinica, and take over Guadalupe Island. 1761: English take over Dominica. 1762: Martinica is taken over by the English (February 4th). In that same date Granada, Tobago, San Vicente, and Santa Lucia were ceded to Great Britain. 1763: Paris Peace Treaty is signed. San Vicente, Grenada, and Dominica were ceded to Great Britain; Cuba was given to Spain; Guadalupe, Martinica, and Santa Lucia were ceded to France. First Phase: the Garifunas led by Du Valleé were such a powerful group that they constantly defeated the English. This group gained power over Kingstown, Dorset shire Hill, and another group lead by Chatolier gained power over Chateaubelair. Both groups soon joined forces, along with men that they ha collected in their way, and became such a powerful group that many feared them. Soon came the death of Chatolier, who was convinced of his paranormal powers and invincibility, who made the fatal mistake of asking Alexander Leith (English) to a duel that caused his death. Chatolier`s death evidently confused the Garifuna-French alliance who held the fighting back and carefully awaited for the next step. Second Phase: In this stage, the hostility lasted a little more than a year, and was characterized for being a war of exhaustion. Set before the numerous losses of seven months of fighting, and finding no solution to solve their differences, the English governor accompanied by the military force of 4,000 men decided to attack the Garifuna-French alliance. Faced upon the military power force upon them, the Garifuna determined that it was convenient to stop the war and finally surrendered. The English began to worry about their future in the island in comparison to the unexpected number of Garifunas living in their new territory. Therefore, the search for new land where the Garifuna could settle began. Finally in February 20th, 1797, a total of 2,248 Garifunas along with stored food supplies were set aboard ships and then headed toward the Honduran Coast and Bay Islands. In April 12th, 1797, the Garifunas first set foot in Honduran territory. Although the English left them with enough food supplies, utensils, fishing chords, and seeds for planting, it became a little difficult to clean the terrain and to plant before the rainy season began. Garifunas then asked the Spanish to take them to the Honduran Coast. The Spanish accepted gracefully because they knew, that by doing this, they would now own the Bay Islands, and they would also acquire an additional labor force. The Spanish kept their promise; Garifunas arrived in Trujillo, Colon (Honduras) on May 17th, 1797. 1. Development of Local Capacities. 2. Incidence and Empowerment of Afro-Honduran population. 3. Institutional Development, Fortification, and Efficiency. La Ceiba Atlántida, Honduras, C.A. · OFRANEH: (Organización Fraternal Negra Hondureña). 1. Provide help to Garifuna Society. 2. Provide defense of Garifuna territory. Address: Bo. Independencia, esquina opuesta Escuela Luis Landa. La Ceiba, Atlántida, Honduras, C. A.